Justine Vogel started her career as an accountant at some of the country’s biggest accounting firms, realizing pretty quickly that “the accounting world was not for me,” she said. She enjoyed working with numbers, but found the work unexciting and uninspiring. She considered getting out of accounting altogether, but her husband convinced her that she might be happier in a different environment. That was when she spotted an ad in a local paper for an accounting position at RiverWoods, a nonprofit continuing-care retirement community that would be opening a few months later in Exeter. “I just knew this was the right way to combine what I was good at and what I was looking for – a place you could make a difference,” she said. She applied for the job and got it, despite her youth and not having the requisite experience they were looking for. By all accounts, it turned out to be a great hire. 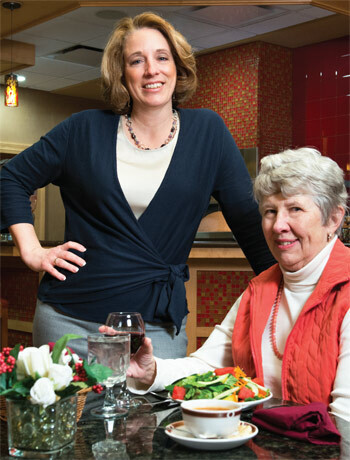 Vogel has worked her way up the ranks at RiverWoods and became its CEO in 2007 when she was just 39 years old. She has been at the retirement community for 18 years – the majority of her career – and her professional growth has mirrored the growth of RiverWoods. It has grown from just one building to a community with three campuses on 200 acres, offering independent living, assisted living and skilled nursing to more than 600 residents. It is the largest taxpayer in the town of Exeter and employs 470 employees – about three-quarters of whom are female. Vogel encourages a workplace culture that offers flexibility for people with families, and established an incentivized wellness program to encourage healthy lifestyles. 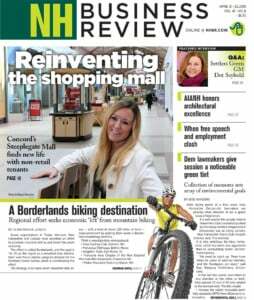 She even created an Emerging Leaders program within RiverWoods, which helps younger employees gain management skills on the job, and has partnered with SNHU to offer employees a chance to participate in a pilot program to receive their associate’s degree at their own pace at no cost for the first year. Perhaps Vogel’s biggest professional challenge came just one year into her tenure as CEO, when she had to decide whether to go ahead with building a third campus, which required borrowing $74 million for the construction just as the economy tanked in September 2008. They decided to push forward with the project, and the project was a success, reaching stabilized occupancy within a year of its being completed. A. I started as the director of accounting here about three months before we opened the first building. I was actually the third choice; I was underqualified, young and didn’t really have the experience they were looking for, but I knew I wanted to be here, and the first person they chose didn’t take the job and the second person didn’t work out. So I was director of accounting for many years, then I became CFO, and after Ridge opened, I became COO, then CEO. A. I think the biggest challenge to becoming the CEO was actually getting over the hump of, ‘Is this something that I want to do?’ I was pretty young — I was 39 when I became CEO, and 37 when the board started to talk to me about it — my kids were young, and I was feeling pretty unprepared. I got some great advice from someone who worked here who said basically, ‘Opportunity is knocking — don’t ignore it. You’re right for this place.’ I just needed a nudge. A. My CEO, the origin, Frank Crane, sort of informally was my mentor just because he expected a lot of me. When he was getting ready to retire, he’s the one who said, ‘You should do this, you can do this.’ Then, when I became CEO, I got introduced to a woman named Kathy Anderson, CEO of a two-community system in Virginia, who has been wonderful. Sometimes being the CEO can be a little lonely. You’re alone in your thoughts sometimes. She has a great way of talking to me where she’ll say, ‘You’re doing great, now do more.’ It’s inspirational — it helps to have someone who sees in you when you don’t believe in yourself. When you do, it inspires you to do more. A. That is a process; it’s something I really strive for. I wanted to be a mom. And some days having a family makes it more demanding, but it’s always better. It’s something you always keep working on. I think sometimes women are too hard on themselves, thinking that the teeter-totter has to be perfectly on balance. So long as one end doesn’t flip the other end off, you’re OK. I don’t think there’s anything wrong with wanting it all. A. Two things: find what you’re passionate about – you can be good at something you like, but if you want to be great, you have to love it – and find your self-confidence. Sometimes women in particular are maybe a little more humble. When you’re confident, you can fight for something you know is right and you can admit when you’re wrong.